You Set The Price !! Over 3000 years of history are waiting for you! Join our Free Tour of Cádiz. Our Free Tour of Cadiz will take you through the most emblematic places of the city and, as its name indicates, it isn't priced. You choose what you pay according to its quality and your budget. 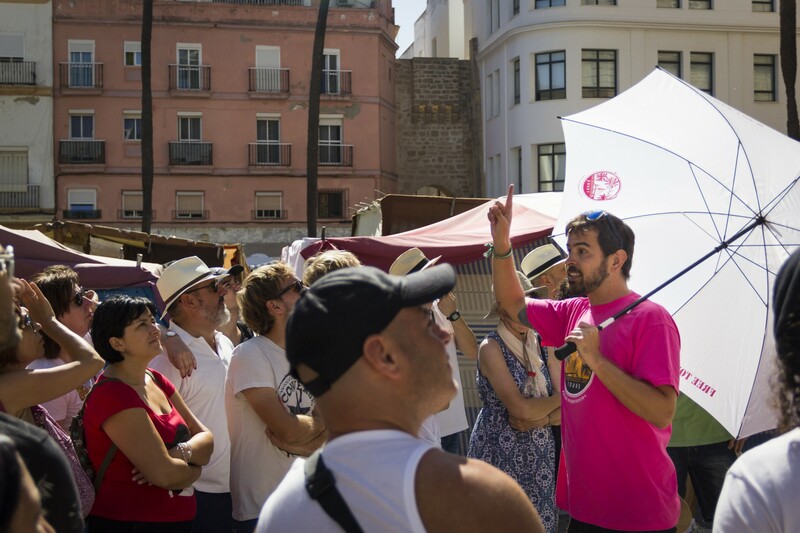 The Free Tour of Cádiz begins in San Juan de Dios square, by the City Hall, as we start our walk through this historical city. From here we’ll jump all the way to Habana, Cuba, in Campo del Sur and enjoy one of the best views in Cádiz: a cultural mosaic where we can distinguish the contrasting footprints of the diverse civilizations that have passed through the city. Next we have the Old Cathedral, formerly a mosque and now known as Santa Cruz church, a quick stop before venturing into the picturesque neighbourhood of el Pólpulo, the oldest in the city, finding our way through the medieval streets into the Roman theatre which lies underground, beneath the neighbourhood. Passing by the Admiral’s house, a unique baroque-style building situated in the heart of el Pópulo, we’ll head towards the Cathedral square where we can appreciate the contrasting architectural styles that make it so unique. From here we’ll make our way through the slightly busier commercial streets towards Plaza de las Flores, situated between palatial homes and the post office building which leads into one of the most beloved stops: Mercado de Abastos, the Central Market, where we will immerse ourselves into its heart contemplating the great variety and freshness of the produce it has to offer, being able appreciate the scale (no pun intended!) of the fishing tradition in the city and the generous diversity of local seafood. Just a few more steps and we enter La Viña, a friendly fishermen neighbourhood with plenty of character, famous for its many tapas restaurants and its carnival, truly a must see one. As we go through the main street, Calle de la Palma, and without forgetting to share with you our very favourite places to eat in the area we’ll reach our final destiny, la Caleta: a small but charming beach guarded by its two castles and under the convenient shade of the Balneario de la Palma, eyeing towards the uncountable fishermen boats that decorate the horizon. The best way to finish a splendid day in the city of Cádiz.